A couple years back we started to look for an effective, eco-friendly, and EASY way to keep our stove top cleaner. After trying several different products (including those awful little squares that you have to cut yourself), we were simply not satisfied with the stove liners that were available for purchase. We thought to ourselves: "There has GOT to be a better way to to prevent burnt-on, greasy food messes from sticking to the top of our stove!" We needed an easier way to keep our stove top cleaner! _Custom cut to perfectly fit your stove! Select the listing for your range's brand and then select your specific model number from the dropdown. _Made out of an ULTRA-THIN Teflon-coated Fiberglass material that allows your stove liner to sit completely flat on your stove and allows food and burnt-on messes to slide right off! _Made out of durable, fire retardant material - up to 650¡. _They are 100% FDA approved and completely PFOA & BPA Free for your safety! We think that our product is really great, and we know you will too. We want to be able to share our stove protectors with everyone - if you don't see your stove's brand or model listed, please don't hesitate to message us. We will either point you in the right direction or let you know what we plan to launch the design for your particular brand/model's stove liner. Thank you for checking out our listing. 100% DISHWASHER SAFE It's never been easier to get your stove top cleaner! Grab your custom fitted StoveGuard stove protector and throw it in your dishwasher - and you're done! EASY INSTALLATION AND REMOVAL -Since StoveGuard stove liners are custom made to fit whatever stove you're currently using, all you need to do is put it on your stovetop, and you're good to go! 100% FDA APPROVED - Your health and safety is our main priority. That is why StoveGuard stove top protectors are FDA approved. They are also PFOA & BPA Free! HEAT RESISTENT TO 650° ♨ - Rest assured that you're safe while keeping your stove cleaner! 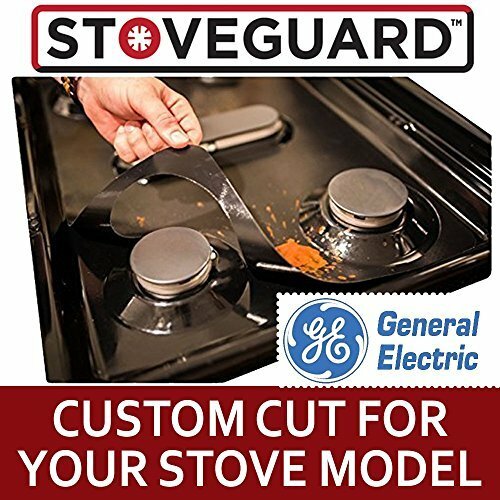 If you have any questions about this product by StoveGuard, contact us by completing and submitting the form below. If you are looking for a specif part number, please include it with your message.